The cloth pads are a revelation for those wanting greater balance and tonal accuracy while retaining the excellent qualities of the Cascade’s beryllium dynamic drivers. The Cascade represents Campfire’s first foray into headphones and boy was it executed with great success! This beryllium driver headphone is premium, dynamic, extended and richly voiced. However, for some, the Cascade was perhaps too much of a good thing, its low-end posing issues with its emphasis on great impact over perfect balance. Several months after its release, Campfire have introduced a pair of aftermarket cloth ear pads that promise a different sound and enhanced breathability. They come in at a reasonable $39 USD and can be easily swapped using the magnetic attachment system of the Cascade. You can read more about the pads and purchase a pair for yourself here. I would like to thank Campfire Audio very much for their quick communication and for providing me with the cloth pads for the purpose of review. All words are my own and there is no monetary incentive for a positive review. Despite receiving the ear pads free of cost, I will attempt to be as objective as possible in my evaluation. The Cloth pads are shaped identically to the lambskin leather pads that ship with the Cascade, however, as their name suggests, they are coated in a porous neoprene-like fabric instead. The padding is also revised, adopting sponge over the memory foam of the originals so they don’t quite mould to the head like the originals. During wear, the cloth pads also do not offer the same smooth, supple feel as lambskin leather, they’re actually a touch scratchy. That said, they do soften over time and aren’t at all uncomfortable, they just don’t disappear like the stock pads. This does come in handy during warmer days and prolonged listening sessions where the cloth pads offer immense breathability that the originals can’t match. As the dimensions remain the same, users who achieve a comfortable fit with the leather pads should experience no issues here. Isolation is slightly reduced as the porous pads don’t offer the same kind of seal though stability remains similar and the headphones remain suitable for general commute as well. These pads definitely don’t exude the same opulent qualities as the stock pads by nature of their BOM, though they do successfully scratch their intended itch. It’s in listening that the Cloth pads make the most sense, offering a more balanced sound through attenuation of the bass in addition to bolstering detail presence. They don’t touch the midrange too much, however, mids are affected as a by-product of changes elsewhere. The cloth pads offer a generally cleaner sound with a more neutral tone. Bass is most changed and strikes as sounding more even with more defined notes. It is less present overall, a prime contributor towards the cloth pad’s more balanced sound in general. Sub-bass extension is reduced a touch, lacking the visceral slam of the better sealing leather pads. Most notably, the pads attenuate the headphone’s notable mid-bass hump. As mid-bass no longer holds as much focus, the headphones sound appreciably more linear, coherent and less bloated. Control actually comes across as slightly reduced with slightly longer decay and hazier edged transients. Still, bass speed remains admirable and reduction in note focus is counteracted by reduced mid-bass presence that provides a cleaner tone and greater separation and definition regardless. By comparison, the midrange sounds considerably less affected though by bringing down the bass, vocals sound more prominent. This is most notable with regards to male vocals that sound more present and slightly cleaner; where the lambskin pads cast a subtle warmth over the midrange. The level to which it occurs is a matter of preference though both sound natural enough to my ear. Upper-mids are, for my tastes, slightly compromised. Similar to the lower-mids, female vocals sound a touch more present with the cloth pads, however, they also sound thinner and less realistic in timbre. This is mostly a result of the cloth pad’s lower-treble emphasis that slightly thins out body and results in some over-articulated, exacerbated by reduced midrange warmth. However, clarity is subjectively improved and some will undoubtedly enjoy a glossier sound if at the cost of body and smoothness. As aforementioned, lower-treble is noticeably more pronounced on the cloth pads. It does not become enhanced to a bothersome degree nor does treble become sharp, metallic or fatiguing. Rather, detail presence is bolstered and foreground instrumentation becomes slightly crisper. Actual detail retrieval is similar though the cloth pads can create the impression of a more nuanced sound as they bring details more to the fore. Those valuing timbre will still appreciate the stock pads as they offer a more natural treble instrument reconstruction. Still, the appeal of the cloth pads is their clarity and attack. Meanwhile, middle and upper-treble remain very similar. The cloth pads do sound more open, however, this is mostly as a result of reduced low-end warmth than accentuation of the higher frequencies. As such, they achieve said openness without increasing fatigue. The cloth pads offer a slightly more open, expansive stage in all dimensions. As the Cascade is quite a powerful sounding headphone, they also do so without sounding diffuse. The pads also benefit from heightened separation. Though bass is not quite as concise, by reducing note size through reduced warmth and mid-bass emphasis, each note is granted more space. This complements increases in dimensions and with the cloth pads installed, the Cascade is a truly grand sounding headphone. There are undoubtedly some facets of the stock pads that I adore; chiefly, their lavish feel on the head, concise bass and lightly warm, musical midrange. By comparison, the cloth pads are simple in construction and they don’t bring the same immediate feel of quality and comfort. Still, when it comes to listening, the cloth pads are a revelation for those wanting greater balance and tonal accuracy while retaining the excellent qualities of the Cascade’s beryllium dynamic drivers. 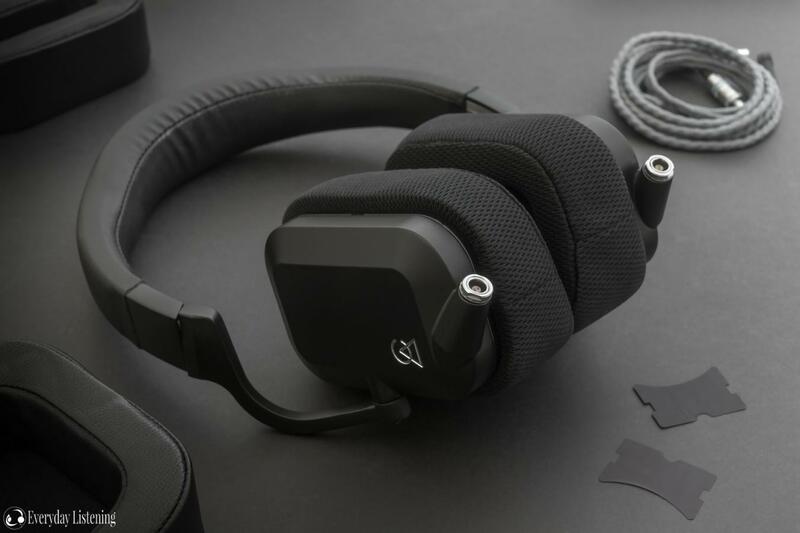 They remain a V-shaped headphone with big bass and a more vibrant treble, however, the increased vocal presence and less dominant mid-bass are very welcome. In conjunction with the 4-included tuning filters, these cost-effective pads make the Cascade an impressively versatile headphone. The Cloth Pads can be purchased from Campfire Audio for $39 USD. I am not affiliated with Campfire Audio and receive no earnings from purchases through this link.